This new Windows 10 Transformation Pack 6.0 will give you Windows 10 UI improvements such as theme and logon screen without touching system files at all so it won't have such risk to harm your system at all. 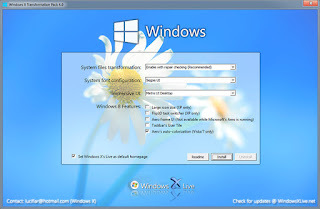 In this package, you'll have Windows 10 inspired themes and applications to make your system resembles Windows 10 as much as possible without modifying system files. *.M3 user interface for installation/configuration. *.Windows 10 Aero Glass or Lite theme. *.Instant M2 and M3 wallpaper/logon screen customization. *.User Tile with current user/wallpaper auto configured on login.